Posted on April 25, 2008 by D.C. 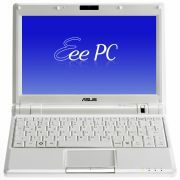 If you are interested in an Asus Eee PC 900, LAPTOP Magazine is running a contest through May 21, 2008, in which you can win one for free (no purchase necesary). This is the 8.9-inch Eee PC 900, with Linux and 20GB of flash-based storage. On that same note, Register Hardware has published their review of the Linux-based Eee PC 900. They rated it fairly high, with an 85% rating, and mentioned that they were able to get 2.25 hours of battery life, but that in general use, you might see three hours. This entry was posted in ASUS, Netbook, News, Reviews. Bookmark the permalink.